Dr. Terence Sim is going to visit Alpen-Adria-Universitaet Klagenfurt on May 6th 2015. Terence is an Associate Professor at National University of Singapore working on face processing techniques. In his talk Terence will discuss his recent work on "Controllable Face Privacy" where he is able to de-identify faces by altering certain attributes while keeping others unchanged. The talk is scheduled for Wednesday May 6th 2015 at 11:00 (s.t.) and is going to take place in the Lakeside Labs seminar room (L4.1.114). The abstract of Ternece's talk and his be are available for download. More information about Ternece and his work is available on his website. We are happy to announce that our paper entitled "Secure Embedded Visual Sensing in End-User Applications with TrustEYE.M4" was accepted for oral presentation at the IEEE 10th International Conference on Intelligent Sensors, Sensor Networks and Information Processing (ISSNIP) which will be held in Singapore, from 7th to 9th April 2015. Head over to the publications section for a pre-print of the paper. The TrustEYE project will be present at the International Conference on Distributed Smart Cameras (ICDSC) taking place in Venice in November 2014. We are going to present a paper about our research in the TrustEYE project as well as a live demo of our TrustEYE.M4 platform. We will demonstrate our on-board cartooning technique for privacy protection. A video sample of this effect can be found in our media section. The TrustEYE project was presented in a talk on September 12th, 2014 at the summer school on Assistive Technologies in Interactive and Cognitive Environments (ATICE) in Vilanova i la Geltru, Spain. The lecture covered basic security and privacy requirements in visual sensor networks and showcased the TrustEYE.M4 platform as an example of a trustworthy camera node. The slides of the talk can be downloaded from the publications section. On June 6th the TrustEYE project participated in the Austrian Computer Science Day 2014 taking place at Graz University of Technology. Prof. Rinner gave a talk on privacy protection, security and self-organization in camera networks. A live demo of our TrustEYE.M4 prototype was shown as well. The TrustEYE project was also featured in a radio interview which aired on June 10th on OE1. A recording of the interview is available below. We are happy to announce that the TrustEYE project will be represented with two papers at the 11th edition of the IEEE International Conference on Advanced Video and Signal-Based Surveillance (AVSS) taking place in Seoul, Korea in August 2014. Authors' versions of the publications are available in our publications section. We are happy to announce a guest talk by Dr. Jorge Fernández-Berni on Wed. April 9th at 16:00s.t. The talk is entitled "Smart imaging, from silicon to vision: challenges and… specifications?". The talk is a joint TEWI / Lakeside Labs Colloquium and is going to take place in the Lakeside Labs seminar room L4.1.114, Lakeside Science and Technology Park B4b. Details about the talk and the speaker are provided in the Abstract. For our latest research project "ProSecCo - Progressing towards Secure and Cooperating Smart Cameras" we are looking for a PhD candidate. The project focuses on the development of security features and privacy protection techniques for smart cameras in monitoring applications. Within the project we explore novel hybrid ARM/FPGA system on chip solutions and the concept of physical unclonable functions as a basis for providing security close to the image sensor. Recently two publications from the TrustEYE team were accepted for publication. The first one is an article in ACM Computing Surveys entitled Security and Privacy Protection in Visual Sensor Networks: A Survey (authors: T. Winkler and B. Rinner, accepted for publication). 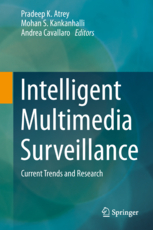 The second one is a book chapter for the upcoming book Intelligent Multimedia Surveillance: Current Trends and Research. The chapter's title is Privacy and Security in Video Surveillance (authors: T. Winkler and B. Rinner, Springer, ISBN 978-3-642-41511-1). The TrustEYE project participates in the 2013 edition of the MediaEval Benchmarking Initiative for Multimedia Evaluation workshop taking place in Barcelona from October 18-19th. Our work entitled "Serious Fun: Cartooning for Privacy Protection" will be presented by Ádám Erdélyi in the session on visual privacy. The working note paper can found on our publications section. The latest revision of the TrustEYE.M4 prototype is now assembled and the related software components are evolving rapidly. The platform is based on a Cortex M4 microcontroller (168Mhz) and provides 4MB of external SRAM. A LiPo battery and a WiFi extension board allow us to operate the system as a standalone node in a visual sensor network. Background information can be found in the prototypes section. The first internal prototype of a TrustEYE sensing unit (following an initial feasibility study) is currently being built in our lab. 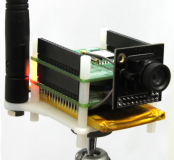 The prototype connects a CMOS image sensor to a Cortex-M4 microcontroller which, in turn, can than be connected to bigger and more powerful camera host systems. The Cortex-M4 will serve as a security and privacy protection unit sitting between the sensor and the actual camera. Currently we are working on the drivers and the software framework. 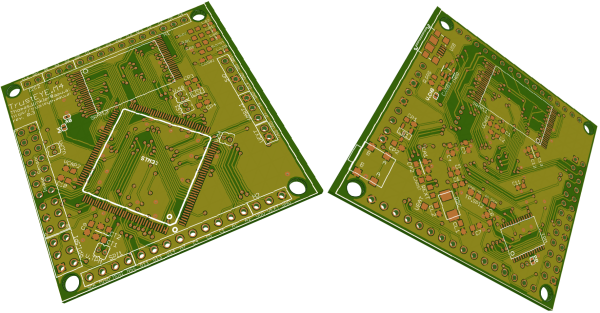 The image below shows a rendering of the prototype's circuit board. We are looking for students from the field of information technology and computer science who are interested in doing a research project or a bachelor / master thesis in the TrustEYE project. We offer a wide variety of topics ranging from the creation of simulation environments and 3D modeling over the implementation evaluation of CV-based privacy protection techniques to low-level development on embedded microcontroller systems. Our project page lists all currently open topics. If you are interested in one of them or if you have further questions please do not hesitate to contact us! Are you interested in privacy and IT security issues in the domain of embedded smart cameras and video surveillance systems? Then this job offer might be for you! Additional details can be found here. We are happy to announce that the TrustEYE project was officially launched in August 2012! The project focuses on research on privacy and security aspects of video surveillance systems and visual sensor networks. Our research proposal has been reviewed and scientifically approved by the FWF and is funded by KWF. The project will be conducted together with our international partner at National University of Singapore (NUS).